A-HOTEL.com - Luxury and cheap accommodation in Michurinets, Russia. Prices and hotel, apartment booking in Michurinets and surrounding. This hotel is located in a quiet area, just a 5-minute drive from Vnukovo International Airport. Free transfer to the airport and a 24-hour reception are featured at Uninn Hotel Vnukovo. Vnukovo Hotel Moscow is set within a 5-minute drive of Vnukovo International Airport, 23 km from Moscow. Guests can enjoy the on-site restaurant. Apartments Zhit Zdorovo on Belorysskaya 13 is situated in Odintsovo. Guests staying at this apartment have access to a balcony. Super - studio Live Healthily "TOGETHER"
Super - studio Live Healthily "TOGETHER" is located in Odintsovo. The property has lake views. Super - studio Live Healthily "FOR TWO"
Offering free WiFi and lake views, Super - studio Live Healthily "FOR TWO" is an accommodation located in Odintsovo. Guests staying at this apartment have access to a fully equipped kitchen. Super - studio Live Healthily "Two + Two"
Super - studio Live Healthily "Two + Two" is set in Odintsovo. Free WiFi is provided. Super - studio Live Healthily "ONE + ONE"
Offering free WiFi and lake views, Super - studio Live Healthily "ONE + ONE" is an accommodation located in Odintsovo. Guests staying at this apartment have access to a fully equipped kitchen. Located in Pykhtino, Art Hotel features free WiFi. This 3-star hotel offers a 24-hour front desk and a concierge service. Featuring free WiFi throughout the property, Hotel Matveevskiy offers accommodation in Odintsovo, 7 km from MKAD Motorway. There is a bowling alley on site and guests can enjoy the on-site restaurant. Located in Odintsovo, Apartment in Glazynino provides accommodation with free WiFi and a kitchenette. Each unit is fully fitted with a washing machine, a flat-screen TV, a sofa and desk. Vacation Home in Glazynino provides accommodation with barbecue facilities and free WiFi, and is located in Odintsovo. The holiday home provides guests with a terrace, a seating area, satellite flat-screen TV, a fully equipped kitchen with a dishwasher, and a private bathroom with bath and free toiletries. Situated in Pykhtino in the Moscow region region, Cozy Studio in Solntsevo Park features a balcony. Guests staying at this apartment have access to a fully equipped kitchen. 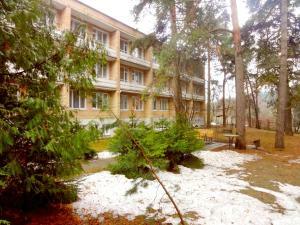 Boasting accommodation with a private pool, Daily Rooms Studio in Soltsevo Park is situated in Pykhtino. This property offers access to a balcony.